Milwaukie City Hall is located at 10722 SE Main Street, Milwaukie, OR 97222; phone: 503-786-7555. Photo: John F. and John H. Broetje House, ca. 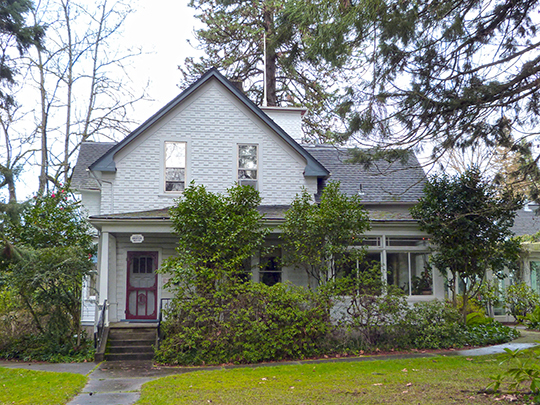 1890, 3101 SE Courtney Avenue, Milwaukie, OR. Listed on the National Register of Historic Places in 1987. Photographed by user:Ian Poellet (own work), 2013, [cc-by-3.0 (creativecommons.org/licenses/by/3.0)], via Wikimedia Commons, accessed January, 2014. Milwaukie is a quiet, suburban town spread over low hills. Founded in 1848 by Lot Whitcomb [1806-1857], it soon became the rival of Portland and other river towns for the commercial supremacy of the Oregon country. Here, on the banks of the Willamette, Whitcomb and his associates constructed the Lot Whitcomb, in its day the finest steamboat plying the river. Milwaukie failed to become the important commercial port that its founder had hoped.